OXFORD, England (CNS) — Catholic clergy in Crimea have defended Ukraine’s right to self-determination. 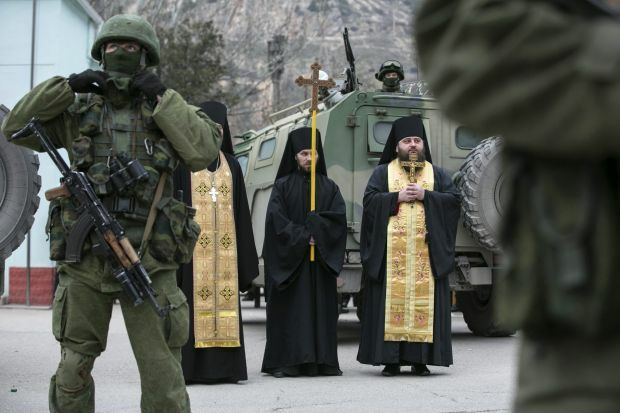 Bishops called for prayers for peace, but a priest in the naval port of Sevastopol said the families of Catholic troops serving with Ukrainian and Russian forces were “deeply confused and worried” about the military confrontation in the Crimean peninsula. Father Jerzy Ziminski, rector of the St. Clement, Pope and Martyr Parish in Sevastopol, told Catholic News Service that he had had no contacts with Russian commanders in the city, but said he had been “treated politely” and allowed through by occupying Russian units when he visited Ukrainian troops March 3 in their local barracks. He criticized ethnic Russians who were staging independence demonstrations in the streets. “The Catholic Church is deeply concerned about the evolving situation in our country, which is now one step from an open war that may involve a larger area,” Bishop Bernacki told the Italian bishops’ conference news service, SIR, March 3. Auxiliary Bishop Jacek Pyl echoed the call for prayers for peace in a statement released March 5 by the Catholic charity Aid to the Church in Need. “With our prayer we reach out to all the people without concern for their religion, political views or ethnic background,” he said. “We pray that the people, who for tens of years live in peace — do not start fighting today and that the bloodshed of the kind we have seen in Kiev Maidan may be avoided here,” he added, referring to violence in Kiev’s Independence Square that led to the ouster of Ukrainian Prime Minister Viktor Yanukovych. In late February, pro-Russian gunmen seized key buildings in Simferopol, where Bishop Pyl is based, and blockaded nearby Ukrainian bases. On March 1 Russia’s parliament approved the use of military force in Ukraine. Oblate Father Marcin Wrzos told Poland’s Catholic information agency, KAI, March 5 that Russian flags were flying on most municipal buildings in Crimea, although Ukrainian administrative offices were still functioning normally. He said he believed local inhabitants were generally “not very interested” whether Crimea belonged to Ukraine or Russia. The priest said parish life was continuing normally, although more people had attended Mass and received the sacrament of reconciliation since the Russian intervention.